Franck has 20 years of experience as Watersports instructor. He has traveled the world managing Wakeboard & Waterski Schools. Franck opened Miami Watersports Paradise in 2012 where where he has been sharing his passion for the sport. He has since opened 2 more Watersports Centers. Franck also holds Master’s Degree in Sports & Hospitality Management, and is currently preparing for the Wakesurf World’s Championship. Sasha is professional water sportsman. He loves what he does and lovers teaching what he has learned throughout his life on the water. He was a professional wakeboarder in Europe, then came to Miami where he can compete and teach all year round. 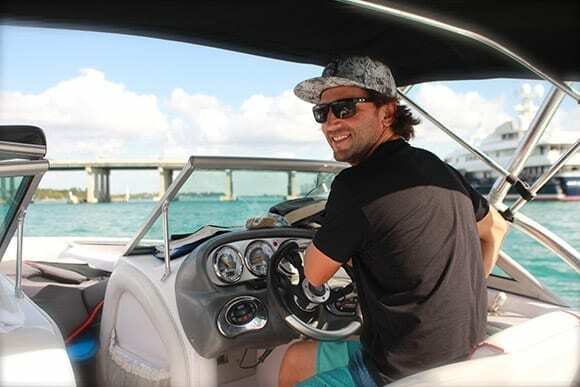 With him, you can do a bit of everything on his favorite stretches of Miami waterways: wakeboarding, wakesurfing, waterskiing and of course, chilling in the Miami sunshine!